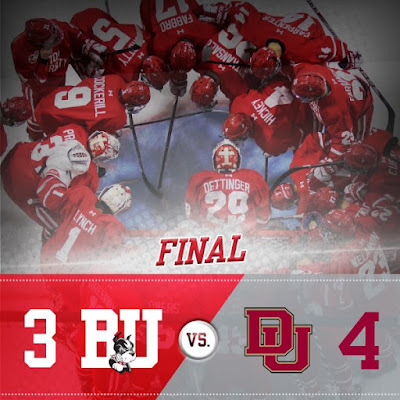 Troy Terry sniped a shot over Jake Oettinger’s left shoulder with 16 seconds left in regulation to push #1 Denver past #6 BU, 4-3, at Agganis Arena. The late goal ruined a strong effort, including pulling even twice after falling behind, against the defending national champions. BU received goals from Ty Amonte, Bobo Carpenter and Dante Fabbro. Red-clad Terrier fans were barely settled in their seats when the visitors grabbed a 2-0 advantage. Just three minutes into the contest, Jake Durflinger beat a BU defender to a rebound and flipped it past Jake Oettinger. A minute later, another rebound goal—by Colin Staub on a power play—doubled the lead. Bottled up early by the Pioneers, BU began to get more O-zone time midway through the period and got on the board when freshman Ty Amonte took a cross ice pass from graduate transfer Drew Melanson and rifled the puck past Tanner Jaillet. BU subsequently went on a power play and a pretty backhand pass by junior Jordan Greenway found classmate Bobo Carpenter in the slot for the equalizer. It was Carpenter’s sixth goal in the past three games. Sophomore Chad Krys also assisted on the play. A questionable call on Amonte—possibly a make-up for a missed call—gave DU a man-advantage late in the period and Staub netted his second power play goal, again on a rebound that BU couldn't clear. After a five-goal first period, the second was scoreless with BU having the upper hand with an 11-8 shot advantage, though Oettinger had to make some tough saves to keep BU within a goal..
More of the same continued in the third as the Terrier defense stiffened and the offense created scoring chances. DU’s Jaillet robbed freshman David Farrance whose one-timer from the right side seemed ticketed. At 13:21, Dante Fabbro’s hard wrist shot from forty feet sailed past Jaillet, who was partially screened by sophomore Patrick Curry. Freshman Brady Tkachuk and junior Ryan Cloonan picked up assists. BU held a 12-3 shot advantage in the period when a timeout was called with about four minutes left. When play resumed, Denver pressed to regain the lead and kept the puck in the BU zone. Terry, the shootout hero of last year’s World Junior Championships, gained control of the puck near the sideboards, skated to the dot in the left circle unimpeded and beat Oettinger high to the glove side for the game-winner. ► Amonte and Melanson registered their first points as Terriers. ► Carpenter enjoyed another strong game in the face-off circle, winning 23 of 33 draws. Terriers are back on the ice Saturday night, visiting Providence for a 7 p.m. start at Schneider Arena. 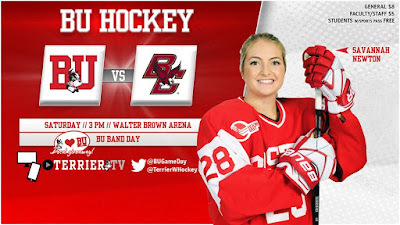 Check back for GameDay links and a Terrier Takeaway. 2018 recruit Joel Farabee scored his ninth goal of the season and assisted on the game-winner as the NTDP U18s edged USHL Cedar Rapids, 3-2. With 15 points, Farabee is the #2 scorer on the U18s. 2018 recruit Ryan O’Connell assisted on a pair of goals, including the game-winner, as Penticton doubled up Alberni Valley, 4-2. The 6’2” blueliner from Gloucester, Ontario, a Toronto draft pick, has seven points in 12 games for the Vees. Danny O’Regan’s fifth goal of the season was the only AHL San Jose score in a 3-1 loss to San Antonio. Sahir Gill scored his second goal in as many games against Laval as Rochester edged the Rocket, 4-3. Terriers will host #3 Boston College today in a 3 p.m. start at Walter Brown Arena. The Eagles bring a 4-0-1 record into the game, led by freshman Darryl Watts with an NCAA best 14 points and senior goalie Katie Burt, who has a 1.97 GAA. Senior Victoria Bach leads the (1-4-0) Terriers with seven points, while senior captain Rebecca Leslie has four points. Bach, Leslie and freshman Nara Elia all have three goals.